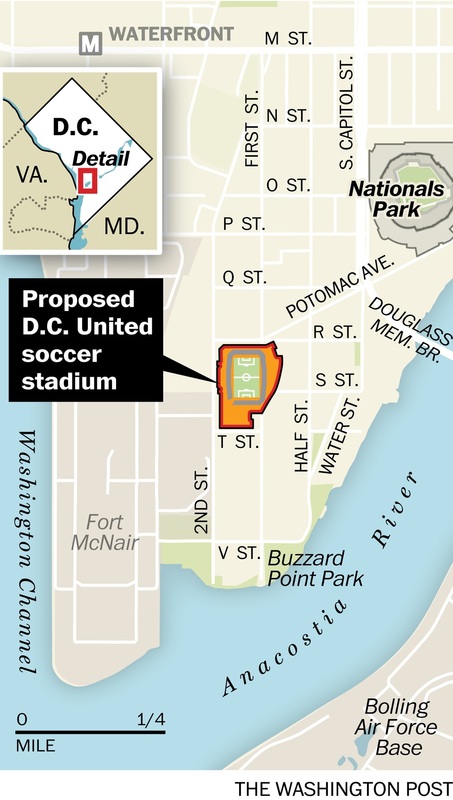 The D.C. Council voted Tuesday to approve a stadium for the D.C. United soccer franchise, making way for a second pro sports facility near the banks of the Anacostia River and probably ending the team’s decade-long search for a new home. The unanimous vote was an unexpected show of support for the project, which had exposed political fault lines as it moved from the back rooms of the John A. Wilson Building to a splashy public rollout last year and on to the legislative machinations of the council. The deal represents a triumph for outgoing Mayor Vincent C. Gray (D), who unveiled the idea more than a year ago. It also placed the spotlight on Mayor-elect Muriel E. Bowser (D), who rallied the entire council behind a previously controversial proposal and signaled that, as mayor, she plans to continue promoting the kind of booming development that has characterized the city in recent years. The plan is expected to cost the District at least $150 million in direct investment and an additional $43 million in forgone tax revenue, and it comes less than a decade after the same body only narrowly agreed to build a far more expensive major league baseball stadium in the same area of the city. The soccer deal benefited from the project’s relatively modest scale, the desire to kick-start development in a gritty industrial zone, and the team’s willingness to bear the roughly $150 million costs of building the stadium itself — the most expensive Major League Soccer facility proposed to date. D.C. United fans, attending the vote in team scarves and jerseys, said they were optimistic the tide had turned for the team, which has been playing home games at six-decade-old RFK Stadium. With Tuesday’s vote, the 20,000-seat facility in the Buzzard Point area of Southwest Washington remains on track to open in time for the 2017 season. Nolan Gonzalez, a 22-year-old University of Maryland student, said he had been watching the team since he was 5 and had attended nearly every home game in the past three years. He watched as teams in other cities galvanized their fan bases by building soccer-specific stadiums. The council is set to take a final vote Dec. 16, and the team might fight for additional concessions. But there is little expectation that the agreement will collapse. The proposal calls for community improvements beyond the stadium, including restoration of a Circulator bus line to the Southwest Waterfront, improvements to the Randall Recreation Center in Southwest and the creation of a “workforce intermediary” to match stadium-area residents with project jobs. D.C. United has been sold twice since efforts to get a stadium built began more than a decade ago. Owners of the team — winner of four championships, more titles than the Redskins — looked at all four quadrants of the District and in Northern Virginia and Baltimore. A former team owner, real estate executive Victor MacFarlane, tried to persuade then-Mayor Adrian M. Fenty (D) to build a stadium on Poplar Point in Southeast Washington. When he was turned away, he held a news conference announcing the team’s departure for Prince George’s County. But Prince George’s wouldn’t play ball, either, and MacFarlane sold the team in 2009. Under the current owners, led by Indonesian media magnate Erick Thohir, the team took a more polished and realistic approach. Levien, a former sports agent and NBA owner, did not try to hold the threat of relocation over the District’s head, and he did not seek a deal akin to the agreement that produced Nationals Park. He said repeatedly that he was committed to the District and wanted the team to grow and thrive here — even if there was no chance of getting a publicly funded stadium, as the Nationals did. The team quickly decided on Buzzard Point as its best, maybe last, chance at a stadium in the District. In Gray, the team found a willing partner, and in his top aide, Allen Y. Lew, it found a man with experience on major economic development projects. The mayor was handicapped from the beginning of his term by allegations of illegal campaign spending in 2010, and he operated under a city debt cap that made borrowing more difficult. When the final year of his term arrived, he was a mayor still in search of a signature achievement. Lew, who oversaw construction of Nationals Park and the city’s convention center, arranged a deal with a complex series of land swaps that would fund stadium construction without any new borrowing. The centerpiece was a proposal to trade the Frank D. Reeves Municipal Center at 14th and U streets NW to a real estate development company, Akridge, in exchange for land the company owns on the stadium site. But critics said the city was undervaluing the Reeves building at taxpayers’ expense; others less welcoming of redevelopment wondered what would replace the municipal building along the historic U Street corridor. Tuesday’s unanimous vote reflected deft dealmaking by Bowser, Gray and the council chairman, Phil Mendelson (D). The proposal had changed considerably from Gray’s original version; the council, led by Bowser and Mendelson, removed the property swap, which had caused unease among members. As chair of a key committee that worked on the deal, Bowser streamlined the proposal to encourage widespread support. But even after Tuesday’s vote, the three were not entirely on the same page. The price of a key parcel of land remains in flux, with the council openly threatening to use eminent domain to keep the project on track. And Gray and Mendelson engaged in a bitter dispute Tuesday over how the plan is to be funded, even as they congratulated themselves on the vote. The council plans to start paying for the project in the current budget cycle by borrowing $62 million and reshuffling $37 million in existing capital projects. Additional costs will be borne in future budgets. Securing the initial funding required the council to pass budget legislation, which under city law only the mayor can initiate. Gray balked at sending down a budget bill for the soccer stadium, saying it would unnecessarily open up the spending plan to other changes. But Mendelson employed an unusual legislative maneuver, financing the stadium by resurrecting a budget bill Gray had submitted in June, which city lawyers and finance officials suggested was improper. The council passed the bill. “The point is to force the mayor to fund the stadium,” Mendelson said. Although the team lost more than $5 million this year, D.C. United could become profitable with a new stadium, and its value could rise from $61 million in 2012 to $195 million in 2019, according to a report commissioned by the council. Levien remained displeased, however, that the council had removed a sales tax abatement worth an estimated $7 million. He said he may seek additional changes in the next two weeks.